Today is the first day of our April ThinkRadial™ course and we couldn’t be more excited to have Guest of Honor Dr. Ferdinand Kiemeneij, MD, PhD, co-proctoring the IR and Advanced IC sections. Dr. Kiemeneij is working side-by-side with co-proctors Sandeep Nathan, MD, MSc, FACC, FSCAI, interventional cardiologist at the University of Chicago Medical Center in Chicago, Ill., and Darren Klass, MD, PhD, MRCS, FRCR, FRCPC, interventional radiologist at Vancouver General and UBC Hospitals in Vancouver, Canada. Twenty-five years ago, the first transradial coronary intervention was performed. This sparked the start of the Radial Revolution—a medical movement that put transradial procedures on the map as a way of treating patients without surgery. 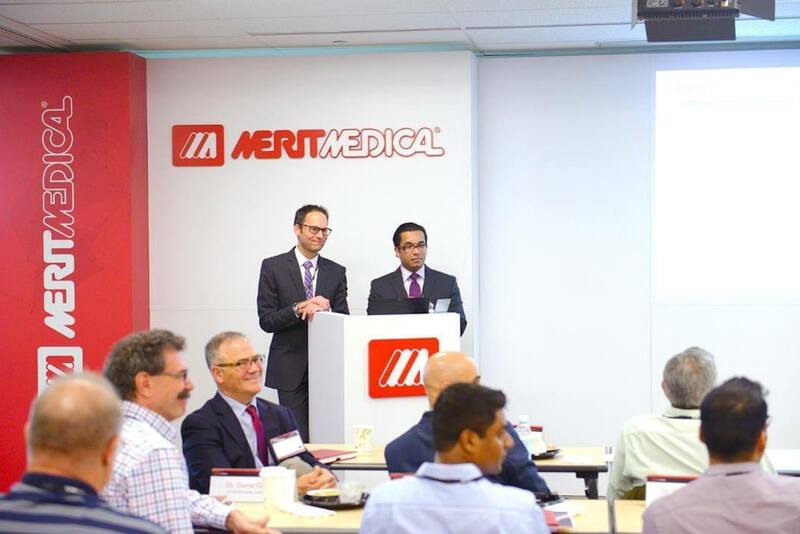 In honor of this progress, Merit Medical is hosting a special ThinkRadial® course April 21-22 for Interventional Radiologists and Interventional Cardiologists. Here’s why you won’t want to miss it. For the first time, Merit is honored to have the “Father of Transradial Intervention” himself—Dr. Ferdinand Kiemeneij—as the special guest of honor at a US ThinkRadial course. In 1992, Dr. Kiemeneij was the first to perform a transradial coronary intervention at the Onze Lieve Vrouwe Gasthuis in Amsterdam. Attendees will be able to learn from Dr. Kiemeneij’s knowledge, expertise, and technique as he co-proctors this one-of-a-kind training opportunity. Read more about Dr. Kiemeneij in this special News Blog. Alongside Dr. Kiemeneij, well-known physicians who are experts in the transradial technique will be proctoring attendees. Interventional Radiologist Darren Klass, MD, PhD, MRCS, FRCR, FRCPC, of Vancouver General and UBC Hospitals will be instructing Interventional Radiologists, while Sandeep Nathan, MD, MSc, FACC, FSCAI, of the University of Chicago Medical Center will be training Interventional Cardiologists. To help Interventional Cardiologists advance to the next level of transradial, for the first time, the April ThinkRadial program features an Advanced Curriculum for Interventional Cardiologists. IC attendees will be able to share and troubleshoot complex cases, learn advanced transradial techniques, and hear an invaluable presentation by Dr. Kiemeneij about new radial techniques and advancements in the field. Interventional Radiologists will have the opportunity to learn the radial technique through direct experience using cadavers, while Advanced Interventional Cardiologists will gain hands-on practice using ultrasound-guided access on realistic arm models. Everyone must start somewhere! Merit invites Interventional Radiologists with little to no transradial experience to the training course, as well as those wanting to improve their technique. Introductory information, including patient prep and room set-up, will be presented. Each advanced Interventional Cardiology attendee will present his/her own complex case for discussion and team troubleshooting. Learning from fellow Interventional Cardiologists can help you better understand potential complications and how to navigate them successfully. Physicians attending the course will learn how to implement the procedure in more complex interventions, expanding your ability to use the transradial approach in more situations. In addition, Dr. Kiemeneij will present new transradial techniques that demonstrate what’s coming down the pipe! The ThinkRadial course will be held in beautiful Salt Lake City, Utah, at the Merit Medical Education Center. 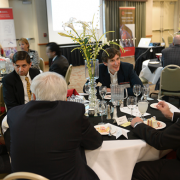 This training event includes a group dinner where attendees can meet and greet each other, as well as listen to a memorable presentation by Dr. Kiemeneij. Merit Medical will pay or reimburse for certain travel and other expenses associated with attending this program in accordance with the AdvaMed Code of Ethics and will appropriately disclose per the Sunshine Act. Travel and reimbursement information will be provided during the registration process. To learn more about registration, visit Merit.com/Education. We hope to see you there! Alicia Armeli is a paid consultant of Merit Medical. For a complete step-by-step guide to delivery, refer to instructions for Use. Please consult product labels and inserts for any indications, contraindications, potential complications, warnings, precautions and directions for use. We are excited to announce the release of the new high flow Pigtail Valved One-Step™ Centesis Catheter! 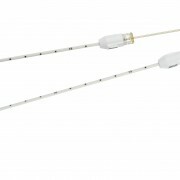 These catheters have been designed for safe, controlled insertion with decreased procedure times. The distal obturator prevents the needle from puncturing and shearing the catheter, and protects the clinician from accidental needlestick. The self-sealing valve also minimizes the risk of air infiltration, and fluid leakage. The sharp needle and smooth transitions ease insertion and decrease patient discomfort, while the depth markers and echo-enhanced needle help with fast and accurate placement. Procedure times may be decreased due to the fast flow rates. When compared with a leading competitor, the high flow Valved One-Step Centesis Catheter has a 16% faster flow rate*. The fast flow rates are due to the pigtail protecting the large drainage holes from occlusion, kink-resistant material, and large catheter and hub inner diameters. To incorporate the high flow Pigtail Valved One-Step Centesis Catheter into your practice, contact your Merit Medical sales professional today or visit merit.com to learn more. Senior Product Manager Stephanie Poulsen speaks about her role guiding strategies for the development of products used for diagnostic and interventional procedures. And more recently, her focus on products specific to the radial approach, a technique that has grown significantly around the world because it allows patients to get up and return to their lives faster. In her I am Merit video interview, Steph shares why she believes that her work at Merit is truly important and how it has touched her life personally. 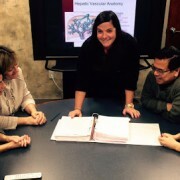 Casey Holland reviewing clinical research with her staff. 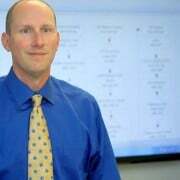 Casey Holland, Clinical Operations Manager for Merit Medical, Rockland, Massachusetts, USA. Perspective. I started working with BioSphere in 2007 in Quality and Regulatory Affairs, which worked closely with Medical Affairs. I worked hard during this period of time. I was really starting to focus and gain perspective on my career, which lead me to make the transition into Clinical Research in 2009. Then Merit acquired BioSphere in 2010 and I became a Merit employee. In 2012, I obtained my Masters degree from Northeastern University in Regulatory Affairs for Drugs, Biologics and Medical Devices. My Masters degree gave me detailed knowledge of all regulations pertaining to the development and commercialization of medical device products. Currently, I oversee all operations for three FDA approved clinical trials using Merit Medical products. Most Rewarding. I feel that every part of my work is rewarding. Being the Clinical Operations Manager comes with great responsibility and importance. I manage a staff of ten highly specialized individuals here at the Merit office in Rockland, Massachusetts. We run three clinical trials involving hundreds of patients. The importance of clinical trials can’t be understated. All of my efforts are directed towards helping people. The development of innovative new treatments and products are important to the ever changing Healthcare Industry. Clinical trials are a crucial part of the innovation and development. I’m not a doctor. I’m not a nurse. But I am making a difference in the lives of patients through medical research. Having found my way of helping people, is what’s truly rewarding. My Part in Our Vision. 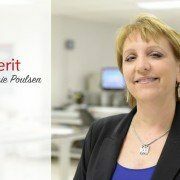 Merit Medical has the vision to “make a difference by understanding our customers needs.” Being the Clinical Operations Manager my work is directed towards understanding and documenting the needs of the patient. Just because a treatment is being used today, doesn’t mean that the treatment should be used tomorrow. Understanding the needs of the customer requires research and the development of new treatments. Clinical research gives us the ability to understand these needs and bring new products to the market. New York Yankees? Absolutely not. No way. Not ever. I’m from Boston, our sports teams are a way of life here. Being from Boston, it’s not even a question of being a fan of our teams. We just are. We are Boston Strong. I just went to a Patriots game last weekend. It’s hard to explain, it’s just a real big thing and not just for the Red Sox, it’s for all our sports teams. Brandon presenting a manufacturing flow chart for an NPI project. My story here began 20 years ago: I started working here in the now “Merit Malvern” office twenty years ago, right after graduating from Penn State University. When I started it was Thomas Medical and I was a supervisor who worked on the team that built the Classic Sheath, a device for implanting leads for pacemakers and defibrillators. Years later we were acquired by GE Healthcare and then in December 2012, by Merit Medical. Now I’m a Senior Manufacturing Engineer, which means I look after our manufacturing processes to ensure efficiencies and quality, including ECN’s and validations. I review work that others produce and mentor other engineers so they can grow in their professions. Thomas, then GE, then Merit: The transitions from company to company has been a positive experience. There’s a group of us who have been together for 15-20 years and have gone through these transitions together, making it all feel familiar. However, looking back over the past 20 years, I have been presented with so many varying opportunities and challenges. My goals from day-to-day and year-to-year are never the same. This has made working here feel new, exciting and challenging all the time. What do you enjoy most about being a Manufacturing Engineer: I love solving problems all day long. Sometimes I feel like a CSI investigator. I love to fix and improve things so I spent many months training to receive my Lean Manufacturing and Six Sigma Black Belt certifications. Several years ago, we found that we were carrying six months of inventory for one of our most popular products. Utilizing lean and six sigma techniques and working with a team to determine how to reduce waste – we reduced the number of people working on that line by half and now only carry a two week inventory. These efficiencies benefit Merit and our customers. Tell us about a project you feel most proud of: I’m proud of many of the projects I’ve worked on but the first one that comes to mind is the Steerable Sheath. I was the lead manufacturing engineer working with R&D and it was the first new project coming out of R&D Malvern incorporating lean manufacturing techniques. The steerable sheath is the most complex product we’ve built in Malvern because it has the most parts and several new unique processes. We’re already at 98% yield and labor is the smallest portion of the cost of the product. After work: I married my wife Meredith the same week I was hired by Thomas Medical, 20 years ago, and my marriage and my career here are still going strong! Meredith and I have three teenagers – two sons and a daughter. Matthew is in college and Christopher and Sarah are in high school. I love hockey and played ice hockey at Penn State. But my real hobby passion is disc golf. Disc golf allows me to see beautiful places while playing a competitive and fun sport. I look forward to playing disc golf at the Solitude Mountain Resort in Big Cottonwood Canyon next time I am in Utah to visit HQ. Tell us about managing Merit Medical’s Customer Service for all of Europe, Middle East and Africa: I manage Merit Medical’s customer service for our distributors, direct customers (hospitals) as well as the tender department for all of Europe, Middle East, Africa and Russia (EMEA). When I started (on November 3, 2008), there were three of us in the Distributor Customer Service department for EMEA and approximately 20 people at our facility. Over the past 7 years the number of employees increased to just over 60 people and I now manage 24 customer service employees, soon to be 25 before the end of this year! 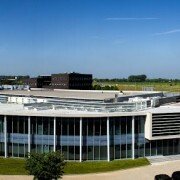 I work from our European Headquarters in beautiful Maastricht in the very southern region of The Netherlands on the border of Belgium and Germany. Tolerance is Key for EMEA Customer Service: The biggest (and most rewarding) challenge for our EMEA Customer Service team is working with 75 countries that speak 12 different languages. This includes 14 countries that sell direct to hospitals and 61 distributor countries. Our team services 1,830 external customers and 75 Merit EMEA sales representatives! Our team speaks Spanish, Portuguese, Danish, Swedish, Russian, English, French, German, Dutch, Norwegian, Finnish and Italian and at all times we need to make sure that someone who speaks that language is available to speak with customers calling in. Tolerance is a very important trait to have when you work in EMEA customer service because we must be familiar with and sensitive to so many different cultures. So I’m sensitive to having a team with a good vibe and I look for people who can maintain a sense of humor while managing so many customers and nationalities. On why it’s all important to Michelle: I once had a job opportunity to work for a company in a different industry. It didn’t feel important to me – medical devices save lives, they are important and that’s why I love this industry. This was confirmed recently when my husband David suddenly had a heart attack at age 39. Products like the ones that Merit manufactures saved his life. We got married this past weekend after 15 years of being together. I would trust Merit products to go into my husband’s body – I know that we make the highest quality and we do everything we can to produce the best we can. What about Merit do you enjoy: Merit has a family feeling, it’s like a second home. The people in this company give you that second family feeling. And Customer Service feels to me like the center of everything. We provide all of the information to planning so they can ensure products ship on time, to finance, to logistics, to regulatory, to marketing, to the customer, internally and externally. To them we are the face of Merit. I have especially enjoyed working with Justin Lampropoulos – he helped me move up from distributor customer service representative to my current position as Customer Service Manager for EMEA. He has motivated me all along the way. His vision for Merit to be the most customer-focused company has been my mantra for our EMEA customer service team – give every country what they need – do anything and everything we can for the customer. That’s what makes Merit very unique in our industry. After work: On the weekends I love to take my two daughters horseback riding. Yadira is 11 and Yuna is 8. Horses really help me to destress from the week and it’s an activity we love doing together. 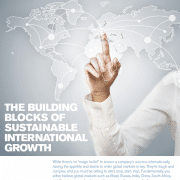 Justin Lampropoulos, Executive Vice President of Sales, Marketing & Strategy for Merit Medical Systems, recently contributed the article, “The Building Blocks of Sustainable International Growth,” to Business Connect Utah magazine. In his article he shares key insights into growing a business internationally, including finding shared culture and values, developing successful channels and building a brand in a new market. 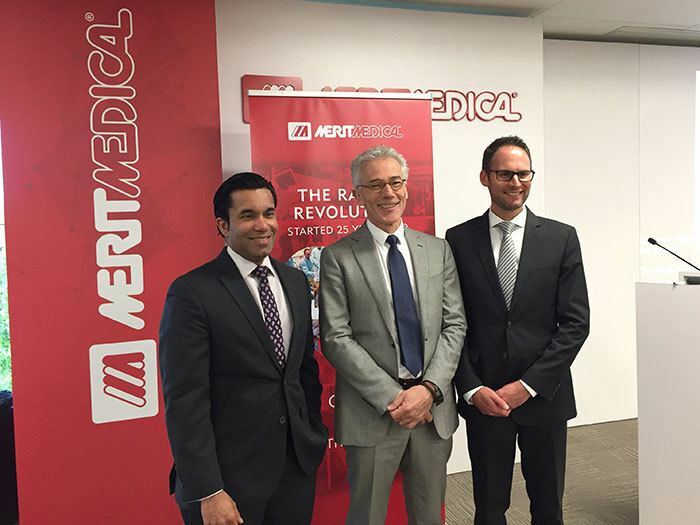 Merit Medical derives nearly 50% of its business from global markets outside the United States. This global success and Merit’s continued growth stems from smart, forward-thinking tactics as well as the company’s stated vision to deliver the best health care possible. Merit uses this universal foundation to follow through globally on its corporate vision: Each day we are determined to make a difference by understanding our customers’ needs, and innovating and delivering a diverse range of products that improve the lives of people, families, and communities throughout the world. Read the Business Connect Utah article. Working for Merit Asia as it continues to grow: I joined Merit Asia five and a half years ago in 2010 as an Administration Assistant. I was the third employee then, and now, as of the end of September, we have 89 employees with Merit Asia! I enjoy working for Merit because it is a friendly, flexible and open environment to present your opinions, share your ideas and discuss better solutions. A good work ethic is always encouraged and outstanding performance is rewarded. 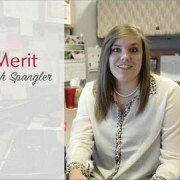 Merit provides us with different kinds of opportunities to thrive. Her responsibilities as Channel Management Supervisor: As Asian Channel Management Supervisor I manage 380 distributors in Mainland China and 30 distributors in Southeast Asia. My key responsibilities include conducting due diligence, legal documentation review, on-line compliance training and Agreement and Letter of Authorization as well as distributor performance evaluation and incentives calculation. In addition to my distributor responsibilities I manage sales promotion control, internal process improvements, data analysis and dealer training. Channel Management is an important function that acts like a “doorkeeper,” to monitor distributors’ qualification and activities, and like a “bridge,” to build up a channel and connect external distributors with internal Merit sales representatives. As the Channel Management Supervisor, I ensure that Merit is receiving maximum benefit from our distributors and contribute to the overall sales organization. On what she enjoys most about Merit: No doubt, if nothing else, THE PEOPLE! People are precious to Merit. All of our incredible achievements have come from the Merit team’s continuous efforts and amazing creations. I enjoy my colleagues who are professional, dedicated and never say never. I am delighted to work with them and celebrate every milestone moment together. How she spends her time outside of work: I am an outdoor enthusiast and like swimming, spinning, mountain climbing and hiking. I will travel around the world during my annual holiday. Reading books and cooking are also my favorites during my spare time. Sales Engineer Sarah Spangler customizes Merit Medical products and devices for Merit’s OEM (Original Equipment Manufacturer) customers. Sarah spends her days collaborating with the OEM sales team, customers and other Merit engineers to ensure that we can provide a product that meets the customers’ needs and procedures. Watch her video interview. Ricardo always tries to include his team – because his team makes him feel successful. At Merit Medical’s newest facility in Tijuana, Mexico, Manufacturing Manager Ricardo Alvarez does everything he can to ensure his employees feel successful – because his team is what makes Ricardo feel successful. The path to becoming the 2nd employee at Merit Tijuana: I moved my family to Tijuana in January 2014 when I accepted a position with Integra, a contract manufacturer to Merit for seven years. At Integra I assembled a high performance team to produce Merit products with high standards for Safety, Quality, Delivery and Costs. This April, I had the privilege to become part of the Merit family as the Manufacturing Manager and second employee at the new Merit Tijuana Mexico Plant. Ricardo’s Hiring Philosophy: I currently have 190 total employees covering Engineering, Facilities, Maintenance and Production. I always try to include my team because my team makes me successful. When I hire I look more at personality and values. I take interviewees to the manufacturing floor to see whether they are passionate and enjoy what they do. Technical skills can be learned, but personality and values is so important because they need to fit well with the team and the company’s vision. How Ricardo Shapes the Merit Culture in Tijuana: Right now we’re the new kids on the block in Tijuana. But my goal is for employees to stay here a long time because many on our corporate team have 15-20 years seniority! And I believe we can achieve that goal if we follow the Merit culture treating people the best we can and looking after our employees’ personal lives. For example, here at Merit we provide free transportation to and from work, lunch and snacks and life insurance – these benefits are not typical around Tijuana and we want to be the best! On his Commitment to Work and Family: My passion is Manufacturing Operations and I feel a high degree of responsibility to ensure every single device is manufactured with quality, delivered on time, meets standard costs and exceeds the expectations of our customers, so they can use my products or any other Merit device to improve their quality of life. My best hobby is my family: my wife Alessandra Aranda is my motivation, she supports me in many ways, listening, coaching and living in the manufacturing world with me. We have two children, Constanza age 9, she loves to do yoga, and Andre who is 2 is getting ready to play Soccer! We enjoy biking or simply watching a movie together and the best feeling is to end up the week every Sunday with the work done and the family happy! At Merit Medical’s Galway facility, Quotes and Samples Analyst, Maeve Harris, enjoys meeting directly with physician customers and helping them find solutions that make their jobs more efficient. 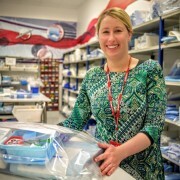 Maeve’s Unique Role at Merit Medical: A Merit sales rep from Europe or a distributor from the Middle East or Asia will come to me if one of their physician customers wants a procedure pack. They’ll tell me what they want in that procedure pack and I’ll price it out and build a non-sterile sample to send to the customer. The procedure pack will include everything the doctor needs for that specific procedure, from devices to accessories that Merit doesn’t manufacture, like drapes. These packs save a lot of time for the hospitals and make the doctor’s job more efficient. Once the doctor orders the pack, my job is done until they want to make a change – then they come back to me. Why she loves coming to work every day: The doctors come to our Vision Building in Galway to meet with me and pull product from our shelves. We collect it all in the pack work area and I build the pack with the customer. I get to meet many new people all the time – our international sales reps and our customers. Every day is different. I really enjoy being able to find solutions for our customers and seeing their appreciation for the opportunity to visit the beautiful Merit facility and the customized efforts we make on their behalf. On why she stays settled at Merit: I grew up in the middle of Ireland. I’ve lived in several places, as distant as Australia. I’ve tried a few different careers. I was a bit of a wanderer until I moved to Galway to work for Merit six years ago. I started on the production line and later became team leader, eventually helping to start Merit’s custom packs business in 2012 – the first production lot was very exciting! I feel very lucky to have been moved up from production – Merit has given me opportunities. There’s always something new for me to learn here and it keeps me going. After work: I love hiking in the mountains and beauty of Ireland. I come from a large family – four sisters and one brother and my nieces keep me very busy! If you could send one message to our customers: Merit provides a very individually tailored product and experience for our customers. Other companies claim that they customize, but they don’t customize like we truly do. The ThinkRadial team is grateful to the clinicians who came from around the US and England to join them for the two-day training course hosted at Merit Medical’s beautiful campus in Salt Lake City, Utah. The program was kicked off on Thursday with welcome remarks, a tour of the facility and an enjoyable evening welcome reception with Merit and the course attendees. Dr. Sandeep Nathan of the University of Chicago, Associate Professor of Medicine and Director, Interventional Cardiology for the University of Chicago Medical Center, was the featured faculty presenter. Beyond his engaging presentations and demonstrations on transradial approach, Dr. Nathan fielded many questions from attendees regarding potential roadblocks, which devices to use and when and how he would approach certain complications that could arise. At the end of the course Dr. Nathan provided his contact info to attendees so they could send him questions once they were back in their own practice. On Friday evening, the ThinkRadial team organized a trip to the charming mountain town of Park City so the group could see the area. Before heading home on Saturday, attendees participated in a lively review of potential transradial complications and how to address them. 1500 Shipments Per Day. Delivery to over 100 Countries. 20 Languages Spoken. It’s not FedEx. It’s not UPS. It’s not TNT. It’s a global medical device company: Merit Medical. Today Merit Medical opened its recently expanded Europe, the Middle East, and Africa (EMEA) distribution center and corporate office in Maastricht, the Netherlands. This advanced distribution center and the service it provides hospitals, physicians, and nurses in more than 100 countries throughout the EMEA region shows Merit Medical continuing its quest to be the most customer-focused company in healthcare. https://www.merit.com/wp-content/uploads/2015/09/LVF_150604001.jpg 284 640 Merit Medical https://www.merit.com/wp-content/uploads/2018/11/merit-header-logo.svg Merit Medical2015-06-16 06:57:002018-08-02 10:43:381500 Shipments Per Day. Delivery to over 100 Countries. 20 Languages Spoken. To meet the needs of radial diagnostic and interventional procedures, Merit Medical now offers the Ultimate 1 shape in both diagnostic catheters and ConcierGE® Guiding Excellence catheters with radial-specific shapes. ConcierGE has approximately 30% more kink resistance2 and better torque response3 than the leading guiding catheter brands. Cardiologists will now have the ability to match their guiding catheter to the shape of their diagnostic catheters, helping to reduce the need for multiple catheter exchanges. Merit’s Performa Ultimate™ diagnostic cardiology catheters include four radial–specific shapes including the Ultimate shape, which can be used in both right and left coronary arteries using a single catheter. ConcierGE and Performa Ultimate–more shapes give radialists more options for successful access. 2 Data on File. Test results are based on 6F guide catheter comparison. 3 Data on file. At ½ hub rotation. Manipulating diagnostic guide wires through radial vasculature can sometimes be a little more complex than the pathways used during femoral access. To help facilitate radial navigation, Merit offers its InQwire diagnostic guide wire in both the standard J 3.0 mm curved tip as well as a 1.5 mm smaller ”baby” J tip configuration. The smaller, more closed J tip can help you navigate through the vasculature without selecting unwanted branches along the pathway. The InQwire guide wire is precoated over the entire wire surface for smooth, consistent coverage that resists flaking. Smooth PTFE coating means less friction which improves trackability, lubricity, and durability. 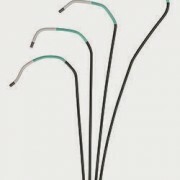 InQwire wires also have precise J-tip memory that ensures tip shape retention during utilization. Having the right tools for your radial procedure provides the efficiency and effectiveness that can help ensure a successful outcome for your patients. Contact your local Merit Sales Representative to learn more about InQwire for radial and our extensive line of products for radial approach. Merit Medical continues to add to its extensive line of products for Electrophysiology. The HeartSpan Steerable Sheath Introducer offers control, coverage and comfort for Electrophysiologists when navigating cardiac chambers. The 8.5F HeartSpan Steerable Sheath Introducer’s braided construction provides kink resistance and curve durability. The distal tapered tip creates a smooth transition from the dilator to sheath introducer to reduce trauma to the atrial septum. The HeartSpan line of products also includes the HeartSpan® Fixed Curve Braided Transseptal Sheath with braided steel shaft for excellent torqueability and the HeartSpan® Transseptal Needle designed to be exceptionally responsive with enhanced stiffness. 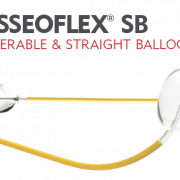 Our EP team is excited to introduce this new steerable sheath designed to help EPs extend their options.